Comfortable rooms and bungalows with helpful staff. Small property excellent for those on a tighter budget. Cute beach, with local roosters. Located on the northwest corner of Moorea, Hotel Hibiscus is surrounded by a lush coconut grove and a beautiful white sand beach. Although slightly farther from the airport and ferry dock than the other resorts on the island, it provides a nice budget friendly option with traditional island charm and the utmost seclusion. The rooms and bungalows at the Hotel Hibiscus are located amidst a tropical garden alongside the lagoon. Each one features a kitchenette, making them ideal for families or couples seeking privacy and independence. The bungalows are the most spacious, and they offer a covered outdoor porch with garden or ocean views. Other hotel amenities include a swimming pool, convenient beach access, and a restaurant and bar located on the shoreline. 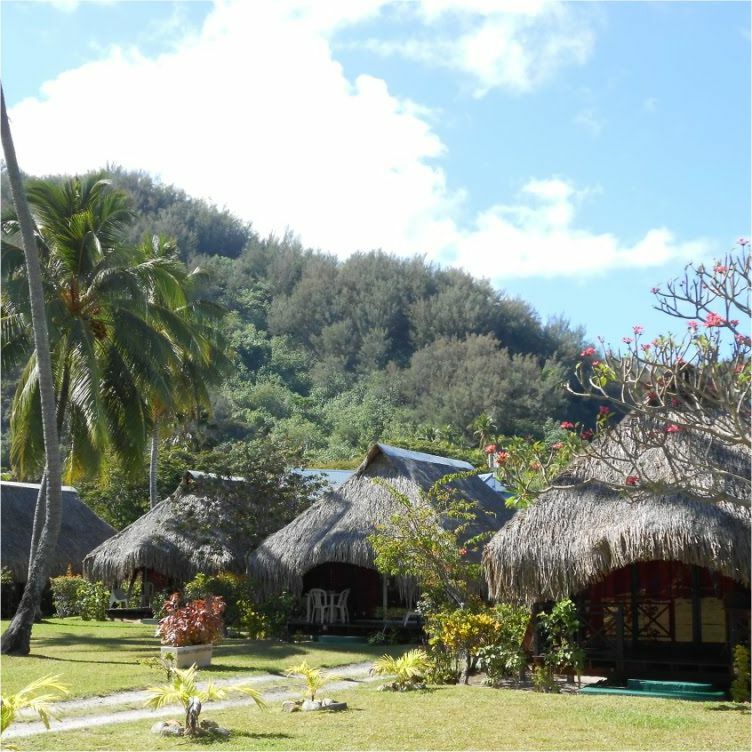 Set in a collection of grass-roof bungalows, this relaxed hotel on Moorea Island is situated by the South Pacific Ocean and 2 km from Moorea Boat Tours. Airy, bright bungalows with bamboo furniture offer kitchenettes with minifridges, living areas and patios with seating. Upgraded bungalows include mosquito nets, and some also have TVs and safes. A breakfast buffet is included. A casual oceanfront restaurant with open-air dining serves Tahitian, French and Italian cuisine. There’s also a bar and beach access.